Nathan Swain was Junior Winner of The Queen’s Commonwealth Essay Competition 2015. He and his family visited the UK to attend the awards ceremony at Buckingham Palace. This page is about the competition, contains Nathan's essay and shows photos of Nathan with his fellow pupils and presenations on Tristan. Eleven year old Nathan Swain has been named the Junior Winner of The Queen’s Commonwealth Essay Competition. The young writer currently lives in the British overseas territory Tristan da Cunha, one of the most remote islands in the world and home to just over 200 British citizens. 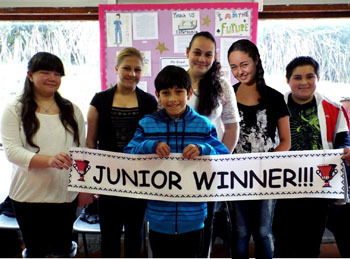 His winning entry was chosen by a panel of Commonwealth judges from more than 7,200 Junior entries. 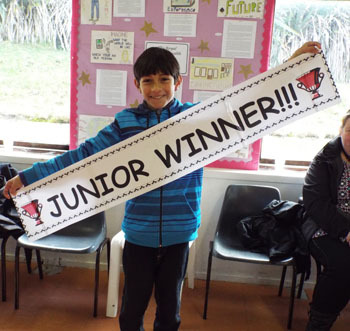 As the junior winner, Nathan will be invited to a special awards ceremony at Buckingham Palace where HRH The Duchess of Cornwall will present the winners with their prizes. The ceremony will form part of a week of cultural and educational activities for the four overall winners of this year’s essay competition. The Duchess of Cornwall will be presenting the prizes on behalf of HM The Queen, Patron of the competition. The Duchess is a keen supporter of promoting literacy amongst young people and adults. The theme of the competition – which is sponsored by Cambridge University Press – was ‘A Young Commonwealth’ and Nathan’s entry is a specific, succinct and clearly articulated account of generational exchange, and of the significance that the skills and lessons passed down from his father hold for him, his surroundings and his community. 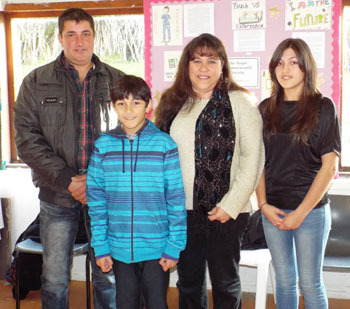 Nathan is currently a student at St Mary’s School, Tristan da Cunha. Nathan likes fishing, swimming and helping his dad to make things. He also loves riding his bicycle around Tristan because of the freedom it offers. in St Mary's School Tristan da Cunha to celebrate Nathan's success and that of the other island pupils who took part. out of only eight entries two other St Mary's School pupils have been awarded medals for their excellent essays. Randall Repetto has been awarded a gold in the junior category and Jade Repetto a bronze in the Senior category. Randall is shown in the group photo above but Jade was with her family overseas. I want to be a carpenter and a builder and learn the skills from the elder people on my island. As I learn, the skills will be passed from those people on to me. When I grow up I want to be just like my dad. My dad learnt how to be a carpenter from his dad and I will learn the skills from my dad. Watching my dad doing his work is amazing sometimes. I do learn a lot from my dad just by watching him. When my dad started working as a carpenter he was only seventeen. Since then my dad has built his own house and used his carpentry skills to build his own fitted kitchen and furniture. My dad taught me that not all work is easy but still I’m looking forward to learning. 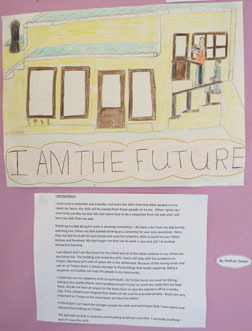 I am eleven and I am the future for my island and all of the other children in my school are the future too. The building and carpentry skills I learn will help with the problems on Tristan, like there isn’t a lot of space left in the settlement. Because of the strong winds and salt air on Tristan there is always damage to the buildings that needs repairing. Being a carpenter and builder will help the people in my community. I could also use my carpentry skills to build boats. On Tristan boats are used for fishing, sailing to the nearby islands, and travelling around Tristan to reach the cattle that are kept there. We do not have an airport so the boats have to take the islanders off to a nearby ship. If the volcano ever erupted then boats can be used to evacuate people. Boats are very important on Tristan so the more boats we have the better. In the future I can teach the younger people the skills and techniques that I have learnt and improve the buildings on Tristan. My dad told me that in carpentry and building anything is possible. I can build anything I want if I have the skills. 'It was a great surprise for us when it was announced that Nathan Swain was the Junior Winner. When the children entered the competition, we just thought that was that and didn't dream that one of them would be a winner. But as I said at the Reception held on Anniversary Day, the school may be small, we may be few in number but we can still achieve. We had to keep everything secret until Anniversary Day and were busy behind the scenes organising a reception to mark the occasion. Those invited to the reception were a little puzzled as to what was going on but all was soon revealed. I don't think Nathan has quite taken it in yet. 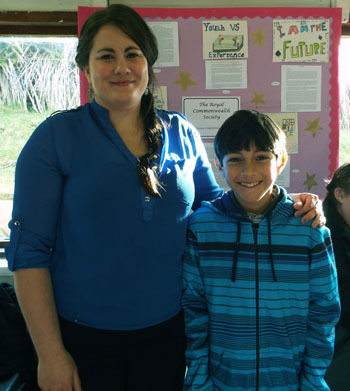 The Island has some wonderful news - Nathan Swain won the Junior Prize category in the Commonwealth essay competition. Over 13,000 students applied from around the world - and this year a Tristanian has won it! That is not only testament to the quality of teaching at the school, but also the high calibre of students we have at St Mary's School. Nathan will be going to the UK, where the Royal Commonwealth Society will be arranging a 'winners week' full of educational activities. At the end of which will be an awards ceremony held at Buckingham Palace. 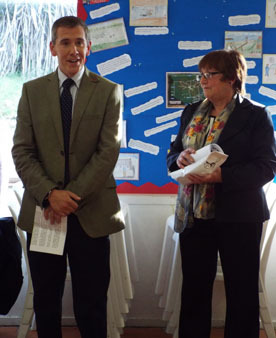 Anne, Poppy, teachers and families arranged a lovely Reception yesterday to announce the results. On Anniversary Day it was great to be able to celebrate a Tristanians world beating achievements. I add my congratulations to Nathan and his teachers for this achievement in winning a major international competition, on behalf of the Tristan Association. But this is far more than a good essay that has won a prize. 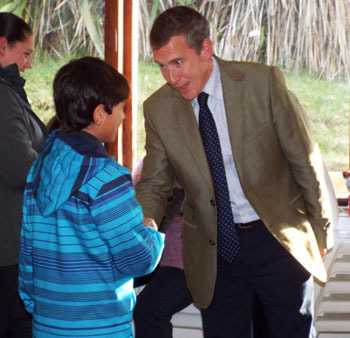 Every word of Nathan's essay is a re-affirmation of what is special about the Tristan da Cunha community: close-knit families who care for one another; pride in the the skills of their parents and grand-parents; wanting to remain on the island and build an even better future. So I add my congratulations to his parents, my former pupils Mark and Paula, who will be very proud of their son. Together they will be shining ambassadors of Tristan da Cunha when they are honoured guests at Buckingham Palace later this year. They will follow a group of their ancestors, led by Chief Willie Repetto, who visited on 9th March 1962, when it was assumed the community would remain in England, and their unique society would be lost. On that day a Tristan longboat was presented to HM Queen Elizabeth II. Today young Nathan aims to build boats. His essay demonstrates that the community made the right decision to return to Tristan after their forced volcanic evacuation to England in 1961. The Tristan Association runs the Tristan Education Trust Fund to support Islanders' education and training overseas - for more see - Education Trust Fund. The island's future is in the hands of its few young people. The Queen’s Commonwealth Essay Competition was founded in 1883 and is the world’s oldest international schools’ writing contest. For 2015 the competition was sponsored by Cambridge University Press and received more than 13,000 entries from over 600 schools in 49 Commonwealth countries and territories. The Junior category is open to entrants aged 13 years and under, and the Senior category is open to entrants aged 14 – 18 years. The theme of the 2015 competition was, ‘A Young Commonwealth’, which is also this year’s Commonwealth theme. The theme underlines the fact that young people account for the majority of the Commonwealth’s population, and recognises their capacity, contribution and potential to shape the future. 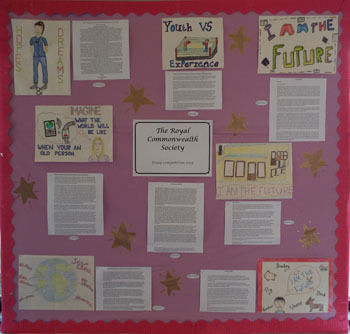 The Royal Commonwealth Society is a network of individuals and organisations committed to improving the lives and prospects of Commonwealth citizens across the world. Founded in 1868, the Society is constituted by Royal Charter (amended 2013) and is a charity in England and Wales (226748). The Society engages with its youth, civil society, business and governmental networks to address issues that matter to the citizens of the Commonwealth. Its primary focus is the promotion of young people throughout the Commonwealth.